Price is 10% above the initial Lego retail price! This comes down to 67.48 cent per brick. The Around the World (10805) Lego set is no longer directly available from the sites below. However, 3rd party partners of these sites might still have the set available. Alternate description Travel between 4 continents by boat or plane to explore habitats and cultures—this set is bursting with 17 animals and 5 LEGO® DUPLO® figures from around the world. Includes 5 LEGO® DUPLO® figures plus 17 animals from all around the world! Forest scene features a buildable house with opening door and table, a tree with greenery and a hanging bridge, plus a bear, squirrel and 2 ducks. Antarctic scene features 'ice block' bricks, a fish, 2 penguins and a whale with opening mouth and water spout element, plus a slide, video camera element and a brick decorated as shrimp. 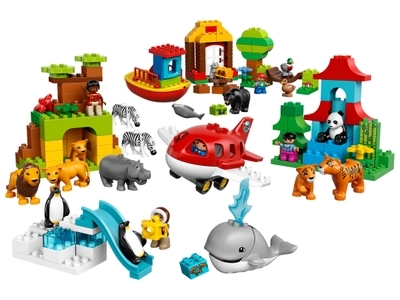 LEGO® DUPLO® Around the World sets encourage early role play with lots of animal fun. Use LEGO® DUPLO® Wildlife sets to talk to your child about wild animals, their habitats, conservation, different places in the world and the people and animals who live there—there's so much to learn!